In these uncertain times, it’s good to know there are still things you can count on. Take the Daiquiri, for example—for more than a century, this simple Cuban classic has proven itself a reliable summer refresher, and as open to creative interpretation as any cocktail on earth. 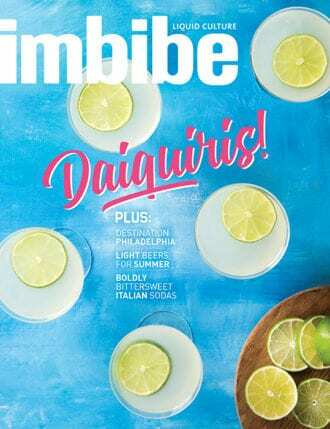 We’re big fans of the drink at Imbibe, and this summer we’re celebrating the Daiquiri and its descendants, with contemporary variations and brushed-up classic versions sure to keep you cool all summer long. You know what else won’t let you down on a hot day? Beer. In our formative beer-drinking years, summer coolers were packed with silver cans of big-brewery light beers, crisp and thirst-quenching yet not entirely satisfying. But as Joshua Bernstein discovers, today’s craft brewers are turning their attention to light beer, with clean, easy-drinking results that will take you all the way through beach season. Toss some soft drinks in that ice chest, too, but if basic soda pop isn’t really your style, take some tips from Sarah Karnasiewicz’s exploration of the bittersweet world of Italian sodas. Summer’s the season to let your fun flag fly, and no ingredient takes the stuffiness out of cocktails like blue curaçao. Jake Emen tells us how the azure liqueur’s gone from declassé to kitschy to just plain fun again in recent years—break out the blue stuff for one of the recipes, and take a crack at that neo-classic, the Blue Hawaii. Garnish that drink with a little paper parasol—Wayne Curtis digs into the history of this ubiquitous cocktail accessory—and modern tiki trailblazer Martin Cate tells us why you should be sipping that beach drink in a dark, windowless bar. Champagne is always in season, and Rachel Signer brings us the story of Brut Nature, the style of sparkling wine that keeps the sugar at bay, making it perfect for summer sipping. And bartenders Misty Kalkofen and Kirsten Amann have long been familiar faces in Boston’s drinks scene—their new book, Drinking Like Ladies, comes out this summer, and Carrie Allan chats with them about working in a male-dominated industry and how they’re aiming to smash the patriarchy. We’ve also got Tom Collins variations, flasks designed for sipping on the go, and Lew Bryson’s brew tour of Philadelphia, America’s original beer capital. You need something reliable to help you through a long, hot summer. Rest assured: A good Daiquiri, a cold beer and a bottle of Champagne will never let you down. Below is a taste of what’s to come, and be sure to pick up a copy of the print edition, because it makes for a great poolside read. A New World Bordeaux-style blend with tons of complexity.